Aquamarine can be use as a calming stone, also believe to resonate ocean energy, and to help connect.. This amethyst pyramid is a powerful tool for ritual practice, crystal healing, and other energetic p..
Angelite, the stone of heightened awareness, peace and brotherhood. Help raise your vibration, and b..
30-35mm Bloodstone pyramid. 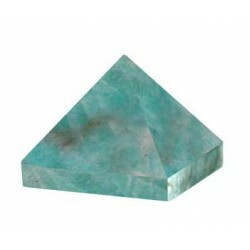 Carved from bloodstone, this pyramid is a powerful aid in energy work, p..